Jellyfish, jellyfish. I hope you love jellyfish! We are creating just the right conditions in our oceans for more jellyfish, including the deadly species of Box jellyfish and Irukandji. We are changing our marine environment giving an advantage to jellyfish over the fish we love to catch and eat, and also giving jellyfish a chance to roam further with warming sea surface temperatures due to climate change. Some of those jellyfish are also very venomous and can deliver lethal stings requiring emergency treatment and hospitalisation that cost our health system and the reputation of our tourism industry. Australian marine scientists have developed a proto-type method for Northern Queensland for forecasting peak times for marine stingers, especially the deadly Irukandji species. But the Abbott Government budget cuts to CSIRO funding in 2014 have brought this research to a stand-still. The reduced funding and employment in marine science comes just as these venomous jellyfish are also spreading their range with warming seas creating a wider Australian, and indeed global health problem. Jellyfish population blooms are trending upwards (Brotz et al 2012), an indicator of marine ecosystems out of balance due to oceans changing much more rapidly due to human influences over the last century. On the Queensland Gold coast a volunteer surf lifesaver, Grahame Long, captured this short video of thousands of 'blue blubber' (Catostylus mosaicus) jellyfish in a 50 metre wide bloom about 400 metres off the beach at Surfers Paradise in January. Huge swarms of these jellyfish were detected on Christmas Eve according to a report in the Courier Mail. There are number of things humans are doing to make the rise of the jellyfish easier including: introduced species to different marine ecosystems, overfishing, coastal construction and artificial reefs, eutrophication (reducing oxygen levels in ocean waters), nutrient and plastic pollution, warming waters due to climate change, and ocean acidification. "It is very simple. We are giving jellyfish exactly the conditions they need to do really well. We are giving them warmer water, we are giving them a lack of predators and competitors, we are taking out their fish. All of these things, and many other things of course .... All these things that they need to flourish are exactly what we are doing. So it is our fault, not their fault, but they are the visible indicator that something in the ocean is out of balance." said Gershwin. While human fishing practices have reduced fish stocks, fish are also under pressure from jellyfish blooms. Jellyfish are able to take advantage of human changes to ocean environments being more tolerant of higher water temperatures and changes in salinity. Added to this, fish stocks have already been identified as moving to higher latitudes due to warming tropical seas with climate change. "It's unbelieveably simple, but unbelievably damaging, these creatures that have no bones, no brain, no will. They eat the eggs and larvae of fish and they eat the plankton that the larvae would eat: this double whammy of predation and competition is actually wiping out fish from the other side. We are also taking a lot of fish out, but they are taking them out on the other side. We are actually in the weird position of being in competition with jellyfish and they have the home court advantage." Gershwin described to CNN. Dr. Monty Graham from the University of Southern Mississippi in this US National Science Foundation Youtube video labels jellyfish as bell-weathers of change, the 'canary' in the sea. He describes how artificial human structures sunk to create artificial reefs have created good environments for nurturing jellyfish polyps, which then result in jellyfish blooms. Most of the 2000 odd jellyfish species are considered harmless to humans although some can deliver painful stings. There are at least 15 'marine stingers' currently known to be lethal or life threatening, but more species are being discovered. 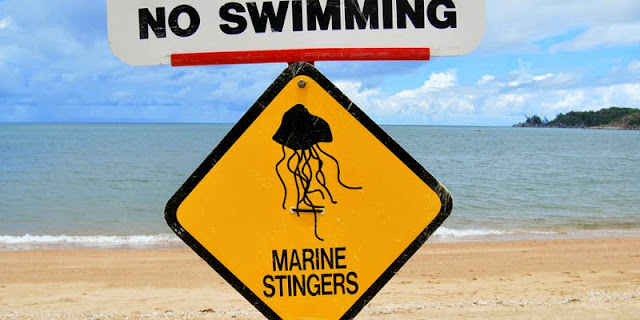 Lethal stingers include Box jellyfish species like Chironex fleckeri and the much smaller and hard to detect Irukandji type species like Carukia barnesi. The tentacles of both these jellyfish types are known to inflict lethal envenomation. Box jellyfish species grow to about 15 to 25 cm in bell height with numerous tentacles from each corner which can grow up to more than 2 metres in length. Although they possess no brain, they can see with three eyes from each corner of their gelatinous bell to navigate, avoid obstacles and catch prey. They are often found in relatively shallow water, where children are more likely to be playing. The tentacles can inflict massive envenomation with their sting causing death to humans in as short as 2–3 minutes. They are known to have killed at least 67 people in Australia since 1883. Most Irukandji species so far catalogued are small - from 1 centimetre to 2.5cm wide with their 4 tentacles reaching up to 1 metre. They are found more often in deeper water at the beach or over reefs with swimmers or divers more likely to come into contact. A new species of Irukandji was discovered recently from north western Australia which may grow up to 50 cm, according to this (ABC News) report. As Irukandji are translucent and mostly very small, people are often unaware immediately when they are stung. They feel perhaps just the slightest tingling feeling at the time the venom is injected, but developing 15 to 20 minutes later into the full blown symptoms of Irukandji syndrome: excruciating lower backpain, nausea and vomiting, difficulty breathing, profuse sweating, severe abdominal cramps, shooting limb spasms, coughing, headache, a feeling of impending doom, severe hypertension. This Youtube video explains how Irukandji inject their venom from the tips of their nematocyst stings, rather than all along the nematocyst cells of other species. While most life-threatening or lethal stings have been in tropical regions, especially North Queensland and Northern Australia, Irukandji syndrome has been diagnosed from as far north as Ireland or as far south as Perth or Melbourne. Treatment of Irukandji syndrome requires hospitalisation and can include cardiac damage and long term permanent health complications. Gershwin (2009) says that there are about 50 Irukandji hospitalizations per year in North Queensland according to the Australian Irukandji Sting Database and approximately the same number again in northern Western Australia. According to Surf Life Saving Australia 2013/2014 annual report (PDF) there were 6,729 recorded marine stings in Australia where Surf Lifesavers applied immediate first aid. 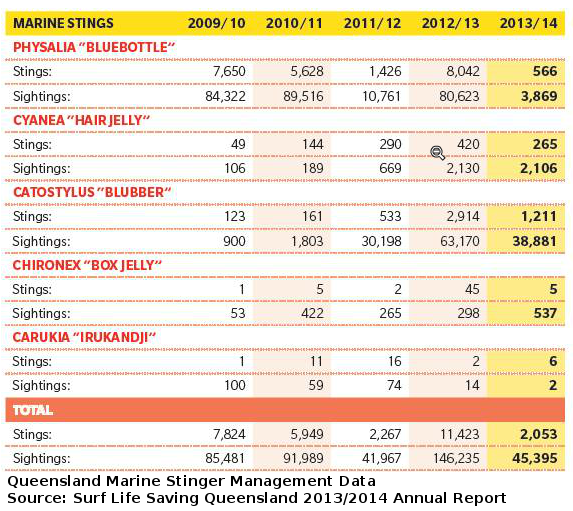 Surf Life Saving Queensland document in their 2013/2014 annual report that 2,053 stings were treated, of which 5 were for Box Jellyfish stings and 6 for Irukandji. A record number of stings were recorded in the 2001-2002 summer season with Cairns Hospital notimg 116 presentations for Irukandji syndrome. One species of Irukandji that was only formally described in 2008 by Gershwin - Morbakka fenneri - has been found from North Queensland to the Moreton Bay region according to the Gold Coast Bulletin report, with a smaller form occasionally found from Coffs Harbour to Sydney. 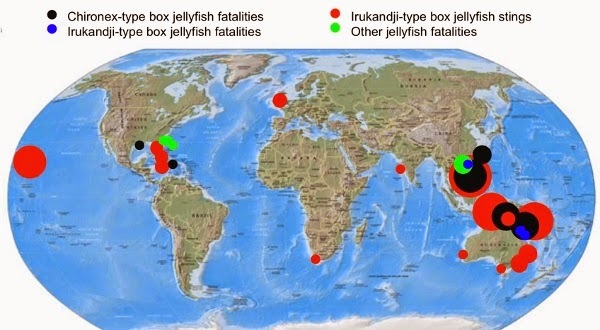 But lethal jellyfish are not just an Australian problem, it is an emerging global health issue. Irukandji syndrome has been described from Florida, the Caribbean, Hawaii, Thailand (Fenner et al 2010), Malaysia (Lippman et al 2011), Philippines and even north Wales. In many of the less developed tropical countries it is likely that many stings are not reported to authorities and fatal attacks are often mis-diagnosed (Gershwin 2009, Lippman 2011). 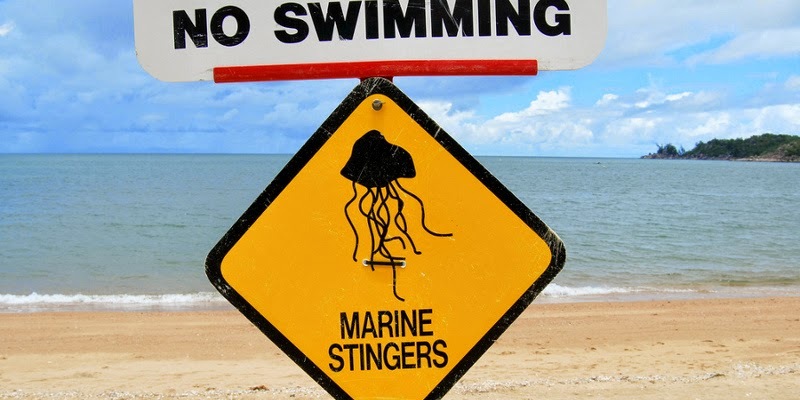 There are now enclosures at many north Queensland beaches to reduce the risk from larger box jellyfish stings, but the mesh cannot be made fine enough and allow the flow of seawater through to keep out the miniature Irukandji. Wearing body covering lycra swimsuits is also effective in avoiding stings, but how many beachgoers under beautiful sunny skies want to put on a full body suit? Beach closure due to the detection of lethal jellyfish usually happens immediately after someone has been stung. Even with pro-active measures such as beach closures and advice that lycra stinger protective swimwear be worn, Irukandji stings still occurr. According to CSIRO, predications of Irukandji blooms in coastal waters can be made by close examination of weather patterns with past sightings and stings to produce a forecasting model. The initial testing of this model in 2013-14 was successful at Cairns with indicator species found and Irukandji caught. (CSIRO: Irukandji forecasting system). While the proto-type forecast worked well, it still requires much field testing refinement for Cairns and development for other regions of the coast. The potentially fatal Irukandji syndrome is relatively common in tropical waters throughout the world. It is caused by the sting of the Irukandji jellyfish, a family of box jellyfish that are almost impossible to detect in the water owing to their small size and transparency. Using collated medical records of stings and local weather conditions, we show that the presence of Irukandji blooms in coastal waters can be forecast on the basis of wind conditions. On the Great Barrier Reef, blooms largely coincide with relaxation of the prevailing southeasterly trade winds, with average conditions corresponding to near zero alongshore wind on the day prior to the sting. These conditions are consistent with hypotheses long held by local communities and provide a basis for designing management interventions that have the potential to eliminate the majority of stings. This research has large economic benefits. The two tourist deaths in Queensland from Irukandji syndrome in 2002 are estimated to have cost $65 million in lost tourism revenue, a substantial blow to the $6 billion per year industry. Treatment of stings is estimated to cost the community a minimum of $1 million to $3 million per annum based upon 1999 calculations. And it seems the predictive forecasting for Irukandji blooms has now stalled through lack of funding, according to a report from the Cairns Post from 2 December 2014. The newspaper reported that CSIRO Marine and Atmospheric Research scientist Dr Anthony Richardson and his team had been unable to attract sufficient funding to continue developing the project. "If we are going to deliver a system for people that's a warning system, we need to be able to deliver it in a user-friendly way and timely without panicking people, or tourism operators. So we’ve been looking to partner with people for funding, but in the last year, funding’s been very tight in science." Richardson told the Cairns Post. With warming seas, conditions are more conducive for jellyfish blooms. From the tropical waters of the Coral Sea adjacent to the Great Barrier Reef, tropical species are also moving further south, aided by climate impacted strengthening of the East Australian current which transports tropical species much further south. (Suthers et al 2011) Like Nemo from the animated movie, we might find tropical marine stingers taking advantage of this current to extend their range putting in jeopardy NSW beaches, including Sydney Harbour and perhaps, in future, all the way south to Tasmania. Professor Jamie Seymour from James Cook University told ABC News (Youtube June 2013) that "the length of the [stinger] season is progressively getting longer and longer and we think that is driven by increased water temperatures." Seymour says that the stinger season has gone from just 2 months fifty years ago to more than 6 months now. "The season still starts in early November but it runs all the way to May and June. If you look at the times in between there is a beautiful correlation with increase in water temperatures and increase in length of the stinger season." "Studies of jellyfish abundance and frequency are under-researched; however, the few studies that do exist seem to implicate an increase in jellyfish numbers over time. (Attrill et al 2007) Various potential factors for this have been cited, from anthropocentric practices such as over fishing and pollution, to climate change and ocean acidification. (Attrill et al 2007, Arai 2001, Purcell 2005) Climate models combining factors of increased ocean temperatures have led researchers to surmise that jellyfish numbers as a whole will increase over the next 100 years. (Mills 2001) Additional to oceanic conditions are the reports of seasonal expansions and blooms of gelatinous species, possibly because of increased global temperatures, and introduction into new areas through changing ocean currents and human activity. (Sullivan et al 2001, Mills 2001) What is abundantly clear is that when it comes to jellyfish trends worldwide, more information is needed on the life cycles and ecology of these animals. (Mills 2001)"
A 2014 study by Shannon G. Klein and colleagues published in Global Change Biology - Irukandji jellyfish polyps exhibit tolerance to interacting climate change stressors - looked specifically at how climate change stressors will impact Irukandji jellyfish polyps, finding that they exhibit tolerance to increasing temperatures and ocean acidity (pH). "We could see increased incidences of the adult jellyfish coming down on the east Australian current. With climate change, the current is strengthening, so in the short-term if the habitats are available, then it is possible that they could establish." warned study lead author Klein in an ABC news report. While we often consider jellyfish in their medusae stage, this research is important for examining stressors on jellyfish in their polyp stage. The study also found a little bit of good news: that the polyp stage may be slightly inhibited by increasing ocean acidification. "To more accurately determine how jellyfish will respond to climate change stressors we must now determine whether our results for A. nr mordens are consistent with other species of Irukandji jellyfish, identify the natural habitat of polyps, assess the tolerance of adult medusae to multiple climate stressors, and determine the potential for jellyfish to adapt to future ocean conditions. The ongoing monitoring of marine species around the world can help identify future changes to marine systems (Hays et al., 2005). The distributions of Irukandji jellyfish are important to assess for human health reasons but would also be a useful way of assessing the pace of range changes along the east coast of Australia." Marine biology Professor Mike Kingsford from James Cook University, who was not involved in the study, drew attention to recent cases from Sydney and Fraser Island: "Probably what caught everyone's attention was an Irukandji turning up in Sydney and Fraser Island in the last few years." Kingsford said that there is a lack of definitive information relating to environmental tolerances of these jellyfish, "They are tolerant of a whole range of conditions that could increase risk, so it's not just simply temperature," he said. "It's having available habitats so that the animal can actually expand its geographic range in a southerly direction. There's a number of factors like rainfall, current strength, temperature and the PH of the ocean that will influence how far they get." reported the ABC. The unusually warm sea surface temperatures off Western Australia in 2013, particularly a spike in temperature in February, may have contributed to the jelly fish blooms and 23 sting hospitalisations by Irukandji species from March to June 2013, according to Lisa-Ann Gershwin and Peter Hannay. Their 2014 paper - An anomalous cluster of Irukandji jelly stings (Cnidaria: Cubozoa: Carybdeida) at Ningaloo Reef (PDF) documents this event. Initial analysis of weather conditions and previous predictive work for the Queensland coast, indicates that "occurrence of such events may become predictable." The authors note that other clusters have occurred following heatwaves in Australia and that, "The implications for this phenomenon in the context of planetary warming projections should be considered a high priority for future reseach." This highlights the importance of both marine and climate research and adequate funding for such programs so that predictive models can be developed to alert beachgoers of high risk times to avoid activities in the water. "The oceans are our life support system. We get our food there, we get our oxygen there, we get our industry there, we get all kinds of things. We have to decide is that of value? I say yes, but I am one of just seven billion people." said Dr Lisa-Ann Gershwin in the 2013 CNN interview. Maybe we need to care more about our ocean environment and how it is changing with global warming and fund the marine science. The Abbott Government budget funding cuts to CSIRO are a very retrograde and damaging action. Instead our governments, state and Federal, continue to subsidise coal mines for profit at the expense of the health of the community and the environment. 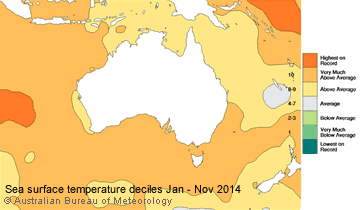 In the short term, development of an effective Irukandji predictive forecasting application has stopped. This application could return significant savings in costs to the health system - up to $10 million per year according to Gershwin, and actually save lives. Dr Lisa-Ann Gershwin describes the rise of the jellyfish in a TedX event at Dublin in September 2014. She delivered a similar talk in January 2014 at TEDxMelbourne. Attrill MJ, Wright J, Edwards M. (2007) Climate-related increases in jellyfish frequency suggest a more gelatinous future for the North Sea. Limnol Oceanogr. 2007;52:480-5. Arai MN. (2001) Pelagic coelenterates and eutrophication: a review. Hydrobiologia. 2001;451:69-87. Purcell JE. (2005) Climate effects on formation of jellyfish and ctenophore blooms: a review. J Mar Biol Assoc UK. 2005;85:461-76. Sullivan BK, Keuren DV, Clancy M. (2001) Timing and size of blooms of the ctenophore Mnemiopsis leidyi in relation to temperature in Narragansett Bay, RI. Hydrobiologia. 2001;451:113-20.